Fine motor skills activities are crucial to a child’s overall healthy development. Children need hours and hours of play time and practice to develop the small muscles in the fingers and hands and coordination skills to manipulate objects. These skills begin to develop and birth and continue to improve throughout childhood development. Below you will find fine motor skills activities and ideas to help encourage healthy development. Fine motor skills can be defined as the dexterity and coordination of the small muscles in the hands and fingers. Children and adults use fine motor skills every single day. We use fine motor skills to: get dressed, eat, draw, write, type, and more! When someone has difficulties with fine motor skills, these everyday skills can be very difficult to master. Play time is so important for infants to develop fine motor skills. Babies need floor play to develop the postural control and shoulder muscle strength to provide stability for the hands and fingers to develop fine motor skills. Therefore, early on the building blocks of fine motor skills are developed through gross motor skills such as playing in prone, rolling over, sitting up, and crawling. Babies need to move, coordinate and receive sensory input through touch and proprioception in order to develop postural stability to free up the hands to manipulate objects and achieve dexterity. Floor play visually attending to colorful objects. Lay under a play gym and freely move arms towards the objects. Use wrist or ankle rattles to encourage the infant to move his/her arms and legs. Move an infant toy so the baby can visually track the toy. The baby can start to reach for the toy with one or both hands. Free play on an infants’ side encourages the infant to bring their hands together. Reaching for baby toys or people’s faces. Picking up small blocks or toys. Banging toy on table or floor. As babies get older and begin to progress with their fine motor skill development, parents and child care providers can begin to offer new play opportunities. Toddlers are busy moving from one activity to the next so don’t expect long attention spans. Although for certain fine motor activities, some toddlers may engage in repetitive tasks completing the same task over and over for a extended period of time if they are highly interested. Poke at squishy objects (ie food play, squish toys, etc.) with their index finger. Put objects inside containers (recycled plastic jars are perfect for this). Mirror play – hands can touch and interact with a mirror on the wall. Picking up Cheerios or other small foods. Water play with small sponges. Practice pouring liquids for outdoor play or in bath. Need More Fine Motor Ideas? 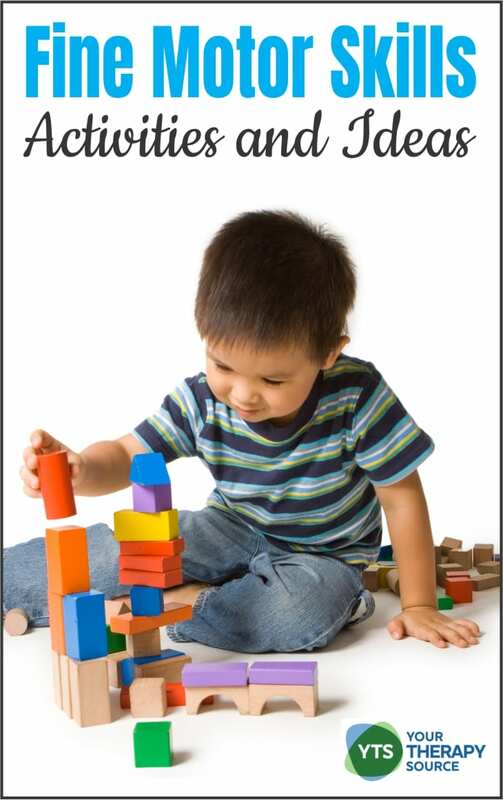 The Basics of Fine Motor Skills is a comprehensive overview of fine motor development that includes age-appropriate fine motor activity suggestions for kids of all ages. Written by Heather Greutman, COTA, the Basics of Fine Motor Skills explain which skills are important for fine motor development and what fine motor development looks like in children at all age levels. FIND OUT MORE. As children continue to develop, always be providing “just right” fine motor skills activities for young children offering practice and the opportunity to build new skills. Preschool classrooms such be rich in fine motor activities and centers to encourage further fine motor skill development. These skills are essential for success in the classroom as the children get older. Don’t forget to always be including gross motor skill activities to strengthen the shoulder girdle and core muscles to provide the stability for efficient fine motor skill development. If you need help with fine motor skill curriculum for preschoolers, Hands First for Learning has a unique vision and philosophy that desires to link health and wellness with kindergarten readiness skills to support the academic success of young children. The resources provide educators, therapists, and parents with activities to develop fine motor and gross motor foundational skills in both the general education and special education populations. The Hands First for Learning books are published by two experienced occupational therapists, Laurie Donovan and Alison Hales and Tama L. Hampton, MA, CCC-SLP. With over 25 years experience working in public schools, the authors understand the needs of school systems, parents, teachers, therapists, and children. Build towers with small blocks. As children enter elementary school the stakes are raised even higher on fine motor skill development. Students need to have all the building blocks in place in order to have legible handwriting to write letters, take spelling tests, and complete math assignments. Technology is frequently not introduced for writing assignments until third grade and later so the early years have a focus on written assignments. Without proper fine motor skill development throughout a child’s lifespan prior to school, tasks such as handwriting, using math manipulatives, managing school supplies, and more can be very difficult. When the foundational skills of strength, coordination, and knowledge are not well consolidated, children struggle to perform fine motor tasks. READ MORE ON THIS SCHOOL FINE MOTOR SKILLS HERE.